If you’re interested in planets or astronomy, you’ll love the following facts about Venus. 1. During the Greek period, Venus was considered as the Goddess of Love and Beauty which is where this planet derived its name from as well. According to ancient science, it is said that amongst all other planets, Venus is the brightest of them all. 2. Venus is believed to be discovered during the Prehistoric Era and is the brightest object in the sky apart from our Sun and Moon. 3. It is also the second planet from the Sun and is quite similar to our Earth in terms of size and dimension. This bright star is said to have a thick atmosphere which traps heat in a runaway greenhouse effect, which in turn makes it the hottest planet in our solar system. The temperatures on Venus can go up to the point of melting Lead. 4. According to Nasa and their satellite images, Venus is revealed to have volcanoes and deformed mountain like structures on its surface. 5. 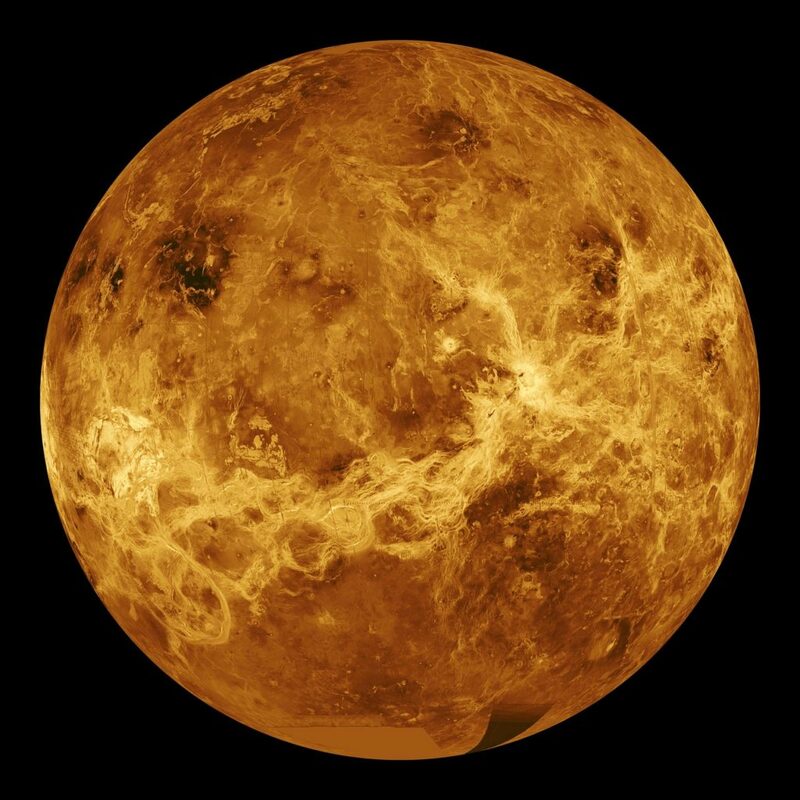 With a radius of 3,760 miles, Venus is similar to Earth in size, just slightly smaller. 6. Amongst the other planets in our solar system, only Venus and Uranus have an unusual orbit and rotation. They both rotate East to West, which means, both planets have a backward rotation. 7. It takes 243 Earth Days for Venus to complete one rotation which makes it the longest day of any planet in our solar system. Interestingly, this rotation takes even longer than a whole year on Venus. 8. When seen from space, Venus looks white on the surface. This is due to the layer of clouds which reflect and scatter the sunlight. On the surface, the rocks are actually grey in color however, due to the thick atmosphere which the planet possesses – the sunlight gets filtered which makes everything look orange if you were to stand on Venus. 9. Craters, valleys, mountains and thousands of volcanoes are some of the natural structures which can be found on the surface of Venus. Almost all these features on Venus are named after amazing Earth Women who have made an incredible name for themselves. For instance, Sacajawea, a Native American woman who guided Lewis and Clark’s exploration has a Volcanic crater named after her. Diana, a Roman Goddess of the Hunt has a deep canyon named after her. 10. Due to the fact that the surface of Venus consists of mainly carbon dioxide, and clouds of sulfuric acid droplets, no human has visited the planet. Although space crafts have been sent there, none of them have lasted very long since the extreme temperatures overheat the electronics of the craft. The past thousand years have brought a great revolution and advancement in the scientific field, which has enabled us to learn a great deal about our planets and the solar system that we live in. According to legend, there has been speculation in the past about life on Venus, however, nothing has ever been proved till date.